Transform client relationship with Social CRM solutions to provide greater insight into your clients and offer services based on tailored client experiences. Small banks to established global companies can have their process implemented as part of SAI customization engagement. 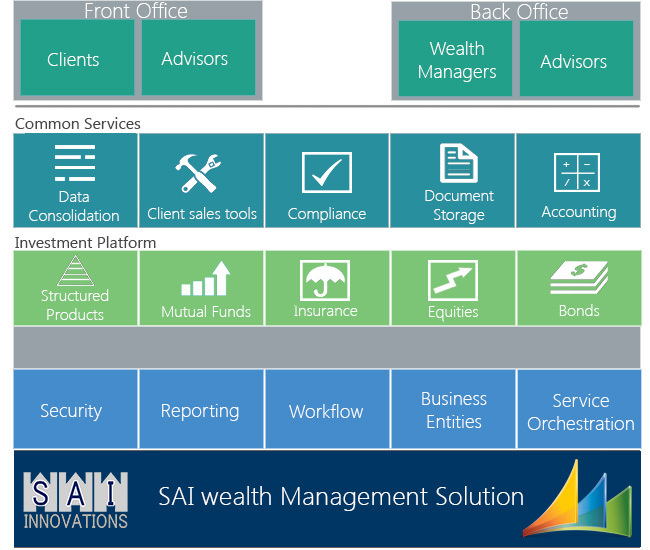 SAI CRM for SAI CRM for Wealth Management solution is built on Dynamics CRM platform and provides wealth managers an enterprise wide 360-degree view of client interactions incorporating integrated financial data on portfolios, accounts, positions, transactions and performance. Relationship Manager will have a close advisor/client interaction and collaboration. The solution can be a single, scalable, integrated, advice and fulfillment platform—bringing together customer interaction channels with decision-making and execution systems. Wealth Managers can achieve short term initiatives of secure client retention, as well as longer term objectives that recognize and address their clients concerns, allowing themselves to enhance acquisition of new clients . Gain competitive advantage in Wealth Management by profitable customer relationship. SAI CRM solution can help understand the true value of clients.